Before we can train our model, we need some data to train it on. The good news here is that there are some high quality public data sets which can be used for training recommender models. We will use a data set from the excellent MovieLens site by GroupLens Research at the University of Minnesota. The particular data set we will use has been made freely available for education and development purposes - thank you MovieLens! You can download the data set yourself using this link. Table 5.3A sample of ratings from the MovieLens data set. The sample shows that each rating gives the ID of the person providing the rating, the movie being rated, and the number of stars that the person gave the movie. 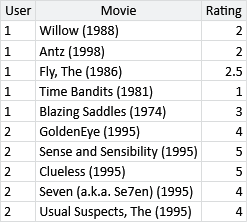 In addition to ratings, the data set also contains some information about each movie – we’ll look at this later on, in section 5.6. It’s a good idea to view a new data set in many different ways, to get a deeper understanding of the data and to identify any possible data issues as early as possible. As an example, let’s make a plot to understand what kind of ratings people are giving. The above sample suggests that ratings go up to 5 stars and that half stars are allowed. To confirm this and to understand how frequently each rating is given, we can plot a histogram of all the ratings in the data set. Figure 5.12The number of ratings given for each possible number of stars (from half a star up to five stars). We can learn a few things about the ratings from Figure 5.12. The first is that whole star ratings are given more than nearby ratings with half stars. Secondly, the plot is biased to the right, showing that people are much more likely to give a rating above three stars than below. This could perhaps be because people are generous to the movies and try to give them decent ratings. Another possibility is that people only rate movies that they watch and they only watch movies that they expect to like. For example, someone might hate horrors movies and so would never watch them, and so never rate them. If they were forced to watch the movie, they would likely give it a very low rating. Since people are not usually forced to watch movies, such ratings would not appear in the data set, leading to the kind of rightward bias shown in Figure 5.12. The model we have developed allows for two possible ratings: ‘like’ or ‘dislike’. If we want to use the MovieLens data set with this model, we need a way to convert each star rating into a like or a dislike. Guided by Figure 5.12, we will assume that 3 or more stars means that a person liked the movie, and that 2.5 or fewer stars means they did not like the movie. Applying the transformation gives us a new data set of like/dislike ratings. a validation set of 28,831 ratings (23,952 likes/4,879 dislikes) covering 4,761 movies. Both data sets contain ratings from 671 different people. To train the model, we attach the training set data to the likesMovie variable and once again use expectation propagation to infer the trait values for each movie and the preference values for each person. However, when we try to do this, the posterior distributions for these variables remain broad and centered at zero. What is going on here? To understand the cause of this problem, let’s look again at the picture of trait space from Figure 5.9, which we’ve repeated in Figure 5.13a. The choice of having emotion on the left and action on the right was completely arbitrary. We could flip these over so that action is on the left and emotion is on the right, whilst also flipping the positions of all the people and movies correspondingly, as shown in Figure 5.13b. The result is a flipped trait space that gives exactly the same predictions. We could also swap the action/emotion trait with the escapist/realist trait, as shown in Figure 5.13c. Again the result would give exactly the same predictions. Notice that Figure 5.13c is also the same as Figure 5.13b rotated by 90-degrees to the left. We can also apply other rotations so that the axes of the plot no longer lined up with our original traits (Figure 5.13d) and we still get the same predictions! When a model’s variables can be systematically transformed without changing the resulting predictions, the model is said to contain symmetries. During inference, these symmetries cause the posterior distributions to get very broad, as they try to capture all rotations and flips of trait space simultaneously. Not helpful! Figure 5.13Examples of symmetries in our recommender model. (a) Original trait space (b) A left-right flip symmetry (c) A flip symmetry caused by swapping the axes (d) A rotational symmetry. 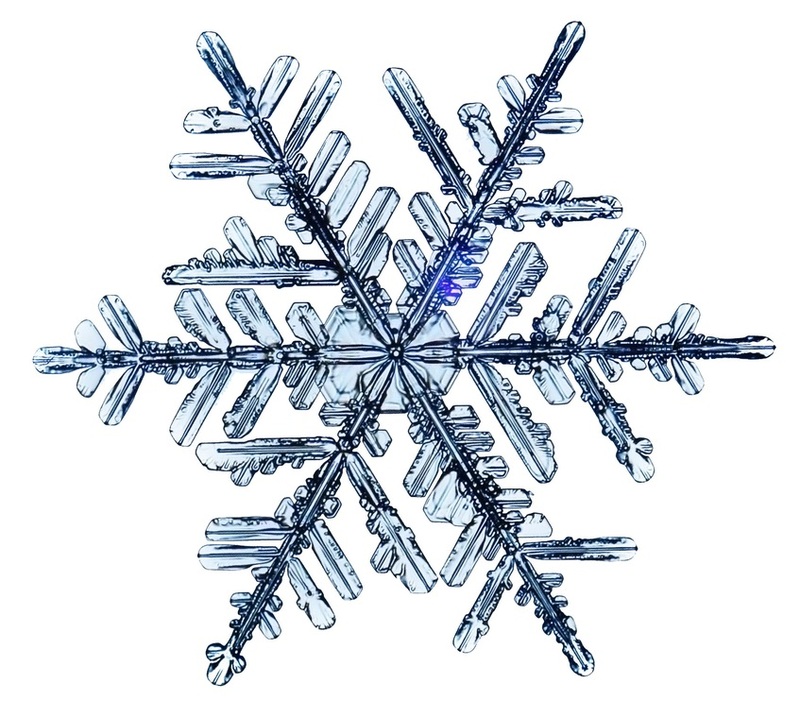 To solve this inference problem, we need to do some kind of symmetry breaking. Symmetry breaking is any modification to the model or inference algorithm with the aim of removing symmetries from the posterior distributions of interest. For a two-trait version of our model, we can break symmetry by fixing the position of two points in trait space – for example, fixing the positions of the first two movies in the training set. We choose to fix the first movie to (1,0) and the second to (0,1). These two points mean that rotations and flips of the trait space now lead to different results, since these two movies cannot be rotated/flipped correspondingly – and so we have removed the symmetries from our model. With symmetry breaking in place, EP now converges to a meaningful result. However, the EP message passing algorithm runs extremely slowly due to the high cost of computing messages relating to the product () factor. In Stern et al. a variation of the EP message calculation is used for these messages, as shown in equation (6) in the paper), which has the effect of speeding up the message calculation dramatically. This faster inference algorithm gives posteriors over the position in trait space for each movie and each person. In many cases, these posteriors are quite broad because there were not enough ratings to place the movie or person accurately in trait space. In Figure 5.14, we plot the inferred positions of those movies where the posterior was narrow enough to locate the movie reasonably precisely. Specifically, we plot a point at the posterior mean for each movie where the posterior variance is less than 0.2 in each dimension – this means that points are plotted for only 158 of our 8,032 movies. The learned positions of people in trait space are distributed in broadly similar fashion to the positions of movies, and so we will not show a plot of their positions. 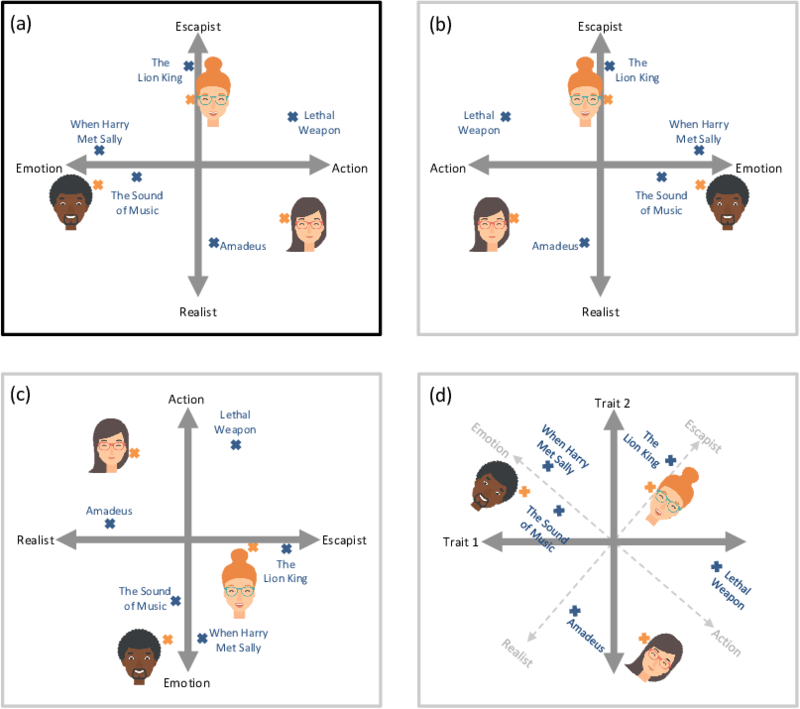 Figure 5.14Learned positions of movies in trait space. For readability, only a subset of points have been labelled with the name of the movie (centered on the corresponding point). 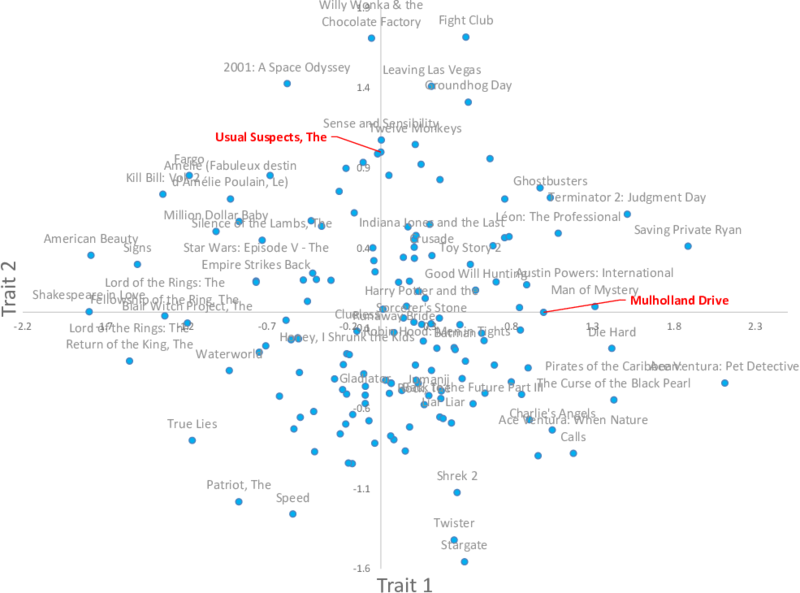 The two ‘anchor’ movies, The Usual Suspects and Mulholland Drive are shown in red at (0,1) and (1,0). This plot shows that our model has been able to learn two traits and assign values for these traits to some movies, entirely using ratings – a pretty incredible achievement! We can see that the learned trait values have some reassuring characteristics – for example, movies in the same series have been placed near each other (such as the two Lord of the Rings movies or the two Ace Venture movies). This alone is pretty incredible – our system had no idea that these movies were from the same series, since it was not given the names of the movies. Just using the like/dislike ratings alone, it has placed these movies close together in trait space! Beyond these characteristics, it is hard to interpret much about the traits themselves at this stage. Instead, we’ll just have to see how useful they are when it comes to making recommendations. symmetriesA symmetry in a model is where parts of the model are interchangeable or can act as equivalent to each other. When a model contains symmetries, this means there are multiple configurations of the models variables that give rise to the same data. During inference, such symmetries cause problems, since the posterior distributions will try to capture all these equivalent configurations simultaneously, usually with unhelpful results. When a model contains symmetries, it is usually necessary to do some kind of symmetry breaking. symmetry breakingModifications to a model or inference algorithm that allow symmetries to be removed, leading to more useful posterior distributions. A typical method of symmetry breaking involves adding perturbations to the initial messages in a message passing algorithms. Other approaches involve making changes to the model to remove the symmetries, such as fixing the values of certain latent variables or adding ordering constraints. [Stern et al., 2009] Stern, D., Herbrich, R., and Graepel, T. (2009). Matchbox: Large Scale Bayesian Recommendations. In Proceedings of the 18th International World Wide Web Conference.